Louisville’s Ninth Street Divide just got a little bit wider, and Downtown Louisville a little less walkable. During a street repaving project, two small pieces of sidewalk in the median of Ninth Street (aka Roy Wilkins Boulevard) at Magazine Street were removed, and engineers from Metro Louisville Public Works say the move is ab effort to increase safety because there’s no traffic signal at the intersection. Work on the $500,000 repaving and sidewalk accessibility project, begun last month, is now wrapping up. Sidewalk ramps between West Market Street and Breckinridge Street were made ADA accessible to better accommodate wheelchairs and the street was repaved between those extents. “Intersections are being modified to improve safety and mobility for pedestrians,” a press release dated mid-November from the city agency stated. That release made no mention of removing sidewalks. Magazine Street is located midway between two signalized intersections (W. Broadway and W. Chestnut). Both of those intersections have traffic and pedestrian signals and are safe locations for pedestrians to cross Roy Wilkins. Magazine street has no traffic or pedestrian signal and the concrete in the center median was promoting pedestrians to cross six lanes of uncontrolled traffic as well as multiple turning movements from all approaches. The concrete was removed to deter pedestrians from crossing at an unsafe location. Removing a sidewalk here won’t deter pedestrians crossing the street—and it won’t increase safety. The problem isn’t pedestrians crossing at this location, it’s that a six-lane speedway runs through the middle of Downtown. All this sidewalk removal accomplished is making the city less appealing to get around on foot. If pedestrians were to cross as city engineers desire, a person would have to walk 570 feet south to Broadway or 450 feet north to Chestnut Street, potentially requiring five or more minutes of extra time to simply cross a street. Forcing people to walk 1,000 feet out of their way effectively reinforces an invisible wall along the street. You’re not welcome here unless you’re in a car. Between adjacent intersections within the city limits of every city at which traffic control signals are in operation, pedestrians shall not cross at any place except in a marked crosswalk. 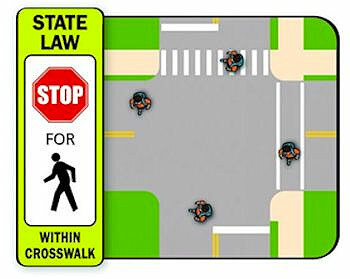 A better approach to pedestrian law makes every intersection a crosswalk, whether it’s marked or not. In general, Kentucky laws are not very friendly for people outside of a car. And it shows. A better model is to treat every intersection as a crosswalk, whether it’s marked or not. Many cities already have such standards, and it’s one way to make a place more walkable and pedestrian friendly. Such an approach would mean motorists would be required to slow down and yield to people crossing at Magazine and Ninth streets, rather than vice versa. But sadly in Louisville and throughout the state, the car is still king. Louisville is in the midst of a three-year, federally funded pedestrian safety campaign called Look Alive Louisville. The program is a response to the city’s above-average pedestrian fatality rate. If removing a sidewalk and making a Downtown street even more of a motor speedway is the city’s idea of pedestrian safety, Louisville won’t make it very far. I understand where you’re coming from, but I pretty intensely disagree. The road ends there. Crossing at that point means you still (most likely) have to go right or left to continue where you’re headed anyway. People are going to cross the intersection whether there is a sidewalk or not! They certainly should have left the existing sidewalks and marked appropriate crosswalks during the project. Louisville continues to preach how they are so compassionate yet their compassion goes out the window during projects like this. Here’s an idea … stop throwing public money at mistakes. Mistakes should be corrected, not rehabbed. I got a similar response when I asked about putting a crosswalk in front of Cave Hill Cemetery’s entrance. It’s over a half mile walk to cross the street legally. The city said it’s safer for pedestrians to cross illegally, than put in a crosswalk and warn cars which gives people in the crosswalk a false sense of security. Point of order! This intersection meets the first test of the state law you quoted and therefore the pedestrian DOES have the right-of-way. Since there is a street intersecting the 6-lane thoroughfare, it is an intersection, and the unmarked crosswalk provision (exception) applies. I interpret the second state law as one prohibiting jaywalking midblock. Ah, but the Chestnut Street and Broadway intersections are NOT adjacent. Magazine Street Intersection comes in between them! And so it’s a legal crossing location. This clause only prohibits *midblock* crossings. Now, here’s another important point. Pedestrians have the absolute legal right to walk along the road (this dates back to medieval England and the US Supreme Court has determined that it’s a Constitutional right under the 9th Amendment). If there *is* a sidewalk, the city or state can require pedestrians to use it. But if there *isn’t* then pedestrians can walk right in the street (on the left side, in most states). And here’s the way to leverage this into a lawsuit: consider someone in a wheelchair. They must transition from the sidewalk on Magazine street to the no-sidewalk portion of Magazine Street here. The removal of the sidewalk makes the situation worse for people in wheelchairs than it was before. This is an ADA violation. Sue the hell out of them. Thanks, Matt & Nathanael! Made mention of this in a post update.